Gardeners are hoarders - it’s a fact! Even the greatest gardens have a pile of odds and ends tucked beneath the potting bench, or round the back of the compost heap, ‘Just in case they come in handy...’. Creative recycling in the garden can often produce some of the most inventive ideas and could save you a small fortune in buying the latest gardening kit. Old compost bags - Old compost bags are well worth hanging on to. Use them as super strong rubbish bags to transport garden waste to the tip, or split them open and peg them down to temporarily suppress weeds. You can line raised beds with them too (although you will need to make some drainage holes first) or better still, grow your own potatoes in them! Fizzy drink bottles - Use large fizzy drinks bottles as mini cloches! Simply cut the bottoms off and place them over individual plants to protect them from the weather until they are well established. You can unscrew the lid to provide ventilation and prevent the plants from getting too hot on warmer days. Aquarium water and pond silt - If you keep a fish tank indoors, then try watering your plants with the old water whenever you clean your aquarium. Your plants will love the nutrients that your fish have left behind! Pond silt is rich in nutrients too. Once composted it turns to black gold that makes a brilliant soil improver. Lollipop sticks - Save your iced lolly sticks during hot summers - they make useful garden markers for labelling plants. Toilet roll holders - Toilet roll tubes are perfect for starting peas, sweet peas, carrots and other crops that require a deep rooting area. Simply fill them with compost and sow seeds into the top of the tube. When you transplant them outdoors, simply plant the entire tube in the ground and let it decompose in the soil. 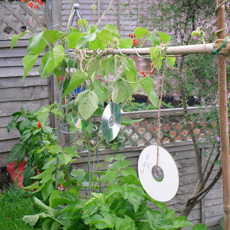 Old CD's - Old CD's make excellent bird scarers. Hang them from strings so that they glint in the sun. Boiled water - Don’t throw away the water when you boil vegetables for dinner. Pop outside and pour it over the weeds that are appearing on the patio. Scalding hot water is guaranteed to damage even the toughest of weeds! Old tyres - Stack old tyres on top of one another to make compost bins or fill them with compost and turn them into mini raised beds. Used compost - Don’t ditch the compost from your patio bags - you can still use it for growing bulbs or quick growing salad crops. After that, dig it into your borders or spread it as a mulch. Plastic punnets and takeaway containers - The clear plastic punnets that you buy strawberries and tomatoes in make perfect mini propagator lids when turned upside down. Most even have ventilation holes punched in them already! Takeaway containers make useful seed trays if drainage holes are made in the bottom. You can even use old plastic meat trays as saucers for your plant pots. They are especially good for 1/2 seed trays - exactly the right size! Plastic Milk cartons - Cut the bottom off a large plastic milk carton at a 45º angle (ensuring you keep the piece with the handle intact). It will make really handy a soil scoop. 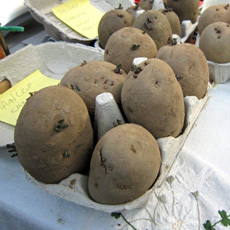 Egg cartons - Old cardboard egg cartons are perfectly designed for chitting seed potatoes. For more information on chitting potatoes read our ‘How to grow potatoes’ articles to learn how to grow potatoes in patio bags or in the ground. Old carpet - Don’t throw away old carpet - there are lots of ways to use it in the garden. If you are creating a pond in your garden you can line the bottom of the hole with carpet to protect the pond liner from being cut or split by stones in the soil. You can also cover compost heaps with carpet to keep the heat in over winter. A large piece of carpet can makes a handy mulch or weed suppressant if you lay it over your plot. Bubble wrap - Don’t throw away bubble wrap. Line your greenhouse with it in winter - it makes excellent insulation! Old CD's are great for scaring away birds as they glint in the sun. Use up old egg boxes for chitting your potatoes. 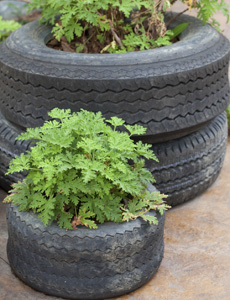 Old tyres are ideal for turning into raised beds or compost bins.